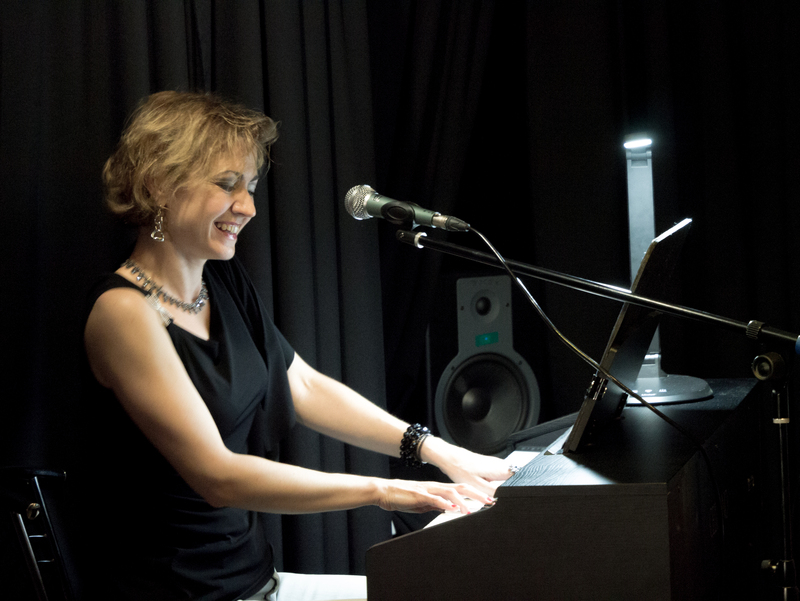 Ekaterina Chernousiva (piano, voice) explores her own rich blend of jazz, Russian folk, and classical music. Ekaterina Chernousova (vocal, piano, arrangements, composition). In 1995 graduated from the Chaikovskiy State Conservatory (Moscow,Russia) majoring in piano and history of music. While studying at the Conservatory, Ekaterina also attended vocal classes at theRussianAcademyof Theatre Arts (GITIS) where she later taught at the Department of Variety Arts for 2 years.Since 2002 Ekaterina Chernousova has been a solo performer of the Russian President Orchestra, which works with such renowned artists as Iosif Kobzon, Lev Leshchenko, Larisa Dolina, Luciano Pavarotti, Igor Butman, Givan Gasparyan, Andrea Bochelli, and others. Before that she combined work as reporter for “Nedelya” (“Izvestiya’s” weekly) and concertmaster of “The Kremlin Ballet” Theater. Since 1997 studied jazz improvisation with the Russian pianist D. Kramer, performed in the Maliy Hall of the Moscow Conservatory, Chaikovskiy Concert Hall, Central House of Journalist, International Music House inMoscow. Performed at jazz festivals in various cities ofRussia. На концерте в Большом Кремлевском Дворце,Георгиевский зал.19.02.2014г. 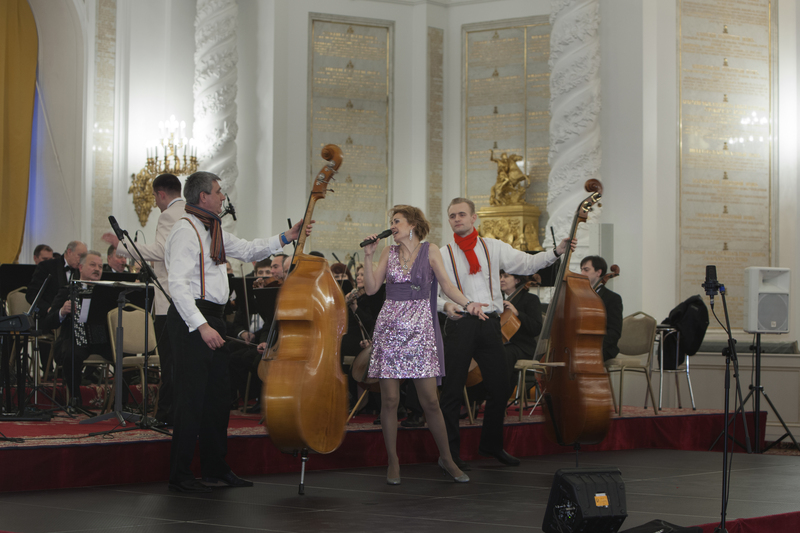 On the New Year concert inThe Big Kremlin Palace with Prezident orchestra. Ekaterina performs inMoscow and other Russian cities with the ensemble named “Komnati” (“Rooms”) which she created in 2001 and has been directing since then.She has been also participating in the Jewish Ensemble which performed many times at the Jewish New Year on Poklonnaya Gora inMoscow, at Hanukkah celebration of the student association named “Gilel”, and at the anniversary of Russian-Jewish Congress. In 2002 the first “Rooms” CD was presented in the Jewish Cultural Center on Nikitskaya St. Soon there came an idea to make a program which will combine Jewish tunes with modern jazz rhythms. It resulted in the release of the second CD – east music in jazz. Its music was highly estimated by such renowned representatives of klezmer music as M. Lerner, M. Sheppert at 4th Klezfest inKiev (2004). And in December of 2004 “Rooms” got the first prize in vocal nomination (Ekaterina Chernousova) at the International Festival inKazanCity (Tatarstan). In 2005 the ensemble performed inSmolensk,Yaroslavl,Voronezh,Tula, and other cities ofRussia andFinland. Ekaterina Chernousova performed as pianist and vocalist at various ethno-jazz festivals, including one inTurku(Finland) and jazz-street in Pori. In 2006, Ekaterina participated in the Russian-American “Open World” Program and visited the United States where she performed at the Lionel Hampton International Jazz Festival (Moscow, ID), which featured such maestros of American jazz as Jeff Hamilton, H.Jones, J.Morrison, R.Hargrove, B.Green and others. Two pieces, performed by Ekaterina (her arrangement of “Hallelujia” and the original composition “Shrovetide”) were a success at the festival. The latter was recorded inMoscow,ID, with support of the drummer and producer Jeff Hamilton. .Other recordings are being currently made, like 2 songs for V. Gorskiy’s album “Lotus of My Heart”. In June 2006, Ekaterina Chernousova was invited by the Russian Consulate inIndiato perform in the city ofBombay. Also she performed many times inFinlandat the opening of art’s exibitions. And in September she participated in A. Vinitskiy’s trio performances in and many others towns ofRussia. as only an accomplished vocalist-pianist-arranger can”. Tamir Hendelman — pianist and arranger (USA), leader of his own trio, member of the Clayton-Hamilton Jazz Orchestra. In 2010 Ekaterina became a member of Moscow Union of composers. Her compositions are perform now inMoscowatMoscowjazz-festivals and at concerts in concert Halls for example Halls of Moscow State Conservatory. The album is mainly based on jazz interpretations of Russian folk and classical music through extraordinary tone coloring: the basic sound element here is multiple interlacing of clarinet parts – their combinations make the core of Andrey Antimonov’s arrangements – now and then the instrumental texture is penetrated by sophisticated vocal Ekaterina Chernousova, piano. Stylistically, this album presents ethno-fusion. The musicians devoted this CD to one of the best contemporary jazz clarinetists – Paquito D’Rivera. Having heard the album, Maestro D’Rivera gave a rather positive review: “Very nice melodies, good playing, composing and arranging, nice clarinet sound!” First performance of the album was done by Rooms jazz band in March 2007, first at the Jazz Art Club and then at the Soyuz Kompozitorov (Composers’ Union) Club. At the same time this program was performed and well received by the audience at the “Jazz upon the Volga” International Jazz Festival in Yaroslavl, and then, in June 2007, at the “What a Wonderful World” International Jazz Festival in Chelyabinsk. In 2004, the Rooms released their second disc, «Im Telech», containing their arrangements of eastern (Jewish and Azerbaijani) songs and their own compositions in oriental spirit. In December 2004, the band became the 1st prize laureate of the music festival and competition in Kazan after which they got invitations to perform in other cities such as Yaroslavl, Saratov, Obninsk. That year the Rooms also participated in several ethno-jazz festivals in Moscow. Now Ekaterina sings a lot of lazz music with symphony orhestras of Russia and other countries. In 2014 Ekaterina win a 3d prize in international vocal competition in S-Petersburg. Now Ekaterina sings a lot of classic and lazz music with symphony orhestras of Russia and other countrie in Russia and Ukrain — Vladivostok, Volgograd,Yaroslavl, Kazan,Nizhniy Novgorod, Dnepropetrovsk and many other towns. In 2009 Ekaterina became a member of Union of Composers of Moscow. And her compositions are taken part in Internatinal Festival of Contemporary Music in Moscow — «Moscow autumn». At this year came a new CD named «Dances of Spring» with own arrangements of classic and folk and original compositions . From 2007 Ekaterina takes part in many different Folk festivals and concerts, like Ethnosfer (S.Filatov fest), «World music festiva»l of A.Kozlov. She performs with such artists as S.Starostin,L.Loyko, I.Izmailov, O.Kireev, A.Gerasimov, G.Gastaryian and others. In 2016 she took part at festival of folk recordings in Bratislava. And many times she performs with her groop ‘ROOMS» at Croos-over fests and competoition. At 2015 Ekaterina win a 3th prize at TEREM-CROSSOVER — 2014″. At the same tome and now Ekaterina sings opera and operetta music. And also takes part at concerts of classic like a vocalist and pianist. Now she has many concerts, works as a solist of Prezident Orchestra and teacher of vocal, and also very often she is a chairman of different vocal competitions. Контакт: Екатерина Черноусова тел: +7(926)228-7561(моб) chernousova_jazz@mail.ru jazzkate7@gmail.com Екатерина и группа "Комнаты" открыты для предложений о выступлениях на корпоративных мероприятиях, банкетах, презентациях и VIP-вечерах. Возможен также формат сольных вокальных выступлений «под минус» - джаз, хиты русской и западной эстрады.